Let’s imagine for a second that tomorrow your washer machine breaks. Laundry is piling up, and your anxiety is building wondering how you are going to get caught up. How do you plan on paying for a new washer machine? Do you dip into your emergency savings, or pull out your credit card? 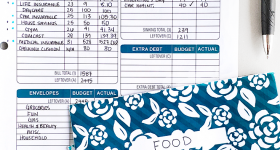 The truth is, these types of expenses can be detrimental to your budget. You need to have a system in place that will allow you to pay for certain planned expenses with cash, so you are not continually going into debt. I get asked every day, “What are sinking funds?” If you follow me on Instagram, you have probably seen sinking funds every time I do a budget overview, you just didn’t realize it. Today, we are going to cover everything there is to know about sinking funds, which funds I include in my budget, and how to use them. A sinking fund is a strategic way to save a little bit every month to pay for large expenses that are planned. You can use a sinking fund for pretty much any major purchase or bill. Have you ever saved up money to buy something you wanted? Then you’ve created a sinking fund. Basically, you are setting aside money now, because you know you will need it for a specific expense later. A sinking fund is designed to save for a specific expense. You know what you are saving for, how much you’ll put in it, and when you will need to use it. 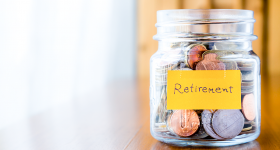 Both of these savings strategies will make you feel more at ease when it comes time to needing the money, but they are created for very different reasons. 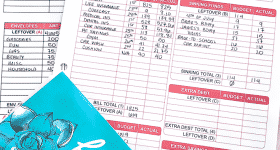 When I first started budgeting and analyzing where my money was going, I realized very quickly that certain expenses came up every year that impacted my budget significantly. There were also expenses that left me swiping my credit card because I wasn’t prepared for the cost, but I needed the money. For example, do you want to take your family of five to the Grand Canyon for five days? There goes $2,000. Is your roof leaking and now you need a new one? That will cost $7,000. What about all of the birthday expenses that come up every year? That’s $500. How about yearly holidays costs, a down payment on a home, or those new snow tires you know you will need next year. The truth is, these type of expenses come up, and no matter what you decide to spend your money on, you need to have a way to pay for it (preferably without going into debt). Save for ANYTHING and be prepared with cash. When I say anything, I mean it! Don’t be afraid to get specific and make a list of everything you need and want. Have fun without feeling guilty. Take that trip you’ve been dreaming about for years. Add that home gym to your spare bedroom and cut out your gym membership. Put that hot tub on the back deck to enjoy with family and friends. Make room for fun in your budget by telling your money where to go every month. Ditch the guilt of spending. Plan ahead (with your spouse or partner, if you have one) and decide what you want to save for and figure out how much you need to set aside every month. When it comes time to spend your sinking fund, you don’t need to worry about where the money is coming from, and you can spend without regret. Plan for the unexpected. We all know that life can throw us curve balls. You never know when, what, or how things will break or fall apart – but you know they will, eventually. Saving a small amount over time for unexpected curve balls (like a new roof, a new washer and dryer, and new tires) will make those circumstances and purchases a lot less stressful. HOW DO SINKING FUNDS WORK? To start using sinking funds, determine how much you can realistically save every month, and decide what you want to save for. Next, put your plan into action. Every month, save money for all of your sinking fund categories so you can use the cash at a later date. Let’s say you have $800 every month that you can apply towards saving. If you were using a regular savings account to put your money into, after a year you would have $9,600. After a year, you and your spouse decide you need to replace one of your vehicles. You go down to the dealership and purchase a car using the $9,600 that you saved. It feels fantastic to use cash for such a huge purchase, right? The problem is, what happens when after buying your new car, your dishwasher breaks, you discover a broken A/C unit, and you have an unexpected medical bill. What do you do? Do you use some of your emergency fund? Do you wait it out and hope the problems disappear? Do you swipe your credit card and figure out how to pay it off later? Here’s how the example would change if you used sinking funds instead. When you and your spouse decide to buy a new car, just like in the scenario above, you now have two different options. You can spend some of your car sinking fund to make some minor repairs and continue to save until your car sinking fund reaches the amount you need to buy the car you want, or you can find another reliable transportation that you like for $4,800. Meanwhile, you will still be able to replace the dishwasher, fix your A/C unit, and cover your unexpected medical expenses. This is all accomplished without touching your emergency savings, and you still get what you need and want without losing your sanity or feeling stressed. HOW MANY SINKING FUNDS SHOULD I HAVE? Large Planned Purchases: This includes things like a new car, a family vacation, or new snow tires. Unexpected Expenses: This includes things like a broken furnace, needing a new roof, replacing broken home appliances, or getting a new computer. Forgotten Expenses: This includes yearly subscriptions, school field trips or sports activities, or clothes for a growing child. By creating sinking funds in these three areas, you can save your emergency fund for real emergencies, and you’ll avoid taking on new debt because you won’t be forced to swipe your credit card. WHERE SHOULD YOU PUT YOUR SINKING FUND SAVINGS? Using a regular savings account for your sinking funds is fine, just make sure you have a way to keep track of how much money you assign to each category. I use different cash envelopes to save for my holiday and event sinking funds, and my yearly subscription sinking fund is saved in a separate savings account at my local credit union. I am very fortunate to have found a credit union that allows me to open as many savings accounts as I want. Assigning custom labels for each savings account is perfect for keeping all of my sinking funds separate. Wherever you store your sinking fund savings, make sure you have instant access to your money or have check-writing privileges. In this post, I cover how I determine what I need to save for and the monthly amount that I need to save. It’s a great worksheet to keep track of your own sinking funds. I keep both savings worksheets in my budget binder, which helps me see if I am on track to meet my future savings goals. You can download both Savings Worksheets in my free resource library here. If you would like some more instruction on how to use the Savings Worksheets, check out this video, and this one! Excellent post, as always. Already bought 2019 Budget by paycheck workbook and started to do it right away. Knowledge and discipline is power. Hey Kumiko! Just wondering where I can purchase the cute sinking fund envelopes in the pictures. Love these. Thanks for all your tips. I have been using the sinking fund method for a few years now (although I call it the Freedom Account, learned from Helen Hunt) and find it to be a life saver. I enjoy and find the information and strategies you give very helpful and insightful. Hi – silly question but where are those cute little bottles from? would love to use that to teach my little ones to save.